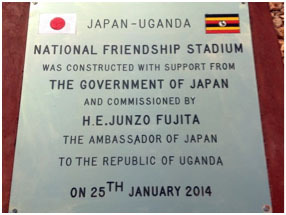 The Japanese Embassy in Uganda funded the construction of the historic first full-size baseball/softball stadium in the country and whole of central Africa. LAUSANNE (SUI) - The Uganda Baseball and Softball Association (UBSA) unveiled its historic new stadium, the National Friendship Stadium, just north of capital Kampala in Gayaza on 25 January. The official opening ceremony, which was attended by athletes, government officials and dignitaries from Japan and Uganda, took place only a little more than a year after the official grant (US$ 122,175) was awarded by the Embassy of Japan in Uganda. UBSA's baseball/softball stadium project was the winning bid among a reported 150 competing proposals that were submitted to the Japanese Embassy in Uganda. "We are absolutely honoured that the Embassy of Japan in Uganda would consider the sports of baseball and softball for strengthening international ties, building friendships and improving society," said WBSC co-Presidents Riccardo Fraccari and Don Porter. "We are extremely delighted for the athletes, our member federation UBSA and our continental body, the African Baseball and Softball Association." Japanese Ambassadors to Uganda -- H.E. Junzo Fujita and predecessor H.E. Kazuo Minagawa -- the Japanese International Corporation Agency (JICA), the National Council of Sports - Uganda (NCS), the Gayaza Parish Catholic Church -- which donated approximately 1.21 hectares (3 acres) of land for the project -- and UBSA all collaborated on and contributed to the successful delivery of Uganda's first full-size national baseball/softball facility. "This is a historic and truly special moment for the community of Gayaza, the nation of Uganda, Africa and the entire baseball and softball world," said the co-Presidents. "The potential for Uganda to grow nationally -- to encourage and motivate their neighbours to grow -- to host internationally sanctioned competitions and welcome countries from East and Central Africa is a major milestone in the global evolution of baseball and softball." Uganda joins the United Kingdom and Sri Lanka (principal sponsor JICA) as the most recent countries to enter into a new era by introducing historic first-ever dedicated baseball/softball stadiums in their respective countries for their youth and athletes. In addition to promoting health and physical education in Uganda, the decision by Embassy of Japan in Uganda to invest in the project centered on baseball/softball's growing participation numbers in Uganda. The Japanese embassy indicated over 20,000 young baseball and softball players in Uganda, who have no option but to play in open fields or on other sports' pitches (when not in use), will have access and be able to enjoy baseball and softball at National Friendship Stadium. "The WBSC shares this vision to use sport as a tool for shaping leaders, promoting gender equity, health, education and teamwork, in addition to learning how to overcome challenges," said the WBSC co-Presidents. WBSC officials state that the Embassy of Japan in Uganda and its partners, in coordination with UBSA, have created a new reality for the community that will generate new opportunities and a lasting legacy for future generations of young students and athletes in Uganda. The core of UBSA's long-term strategic-plan has been focused aggressively on youth development and gender equity, with participation numbers of young baseball/softball athletes skyrocketing from 1,500 in the year 2000 to over 20,000 in 2013. "Baseball and softball's gender balance make it a just human pursuit," explained UBSA general secretary Owora Deusdedit. UBSA leadership also has further plans to add international standard spectator seating, a press room, a hostel and team clubhouses.